She’s aquatic, vaguely royal and might just have an eye on the future. Thanks to Nessa for suggesting the intriguing Delphina as Name of the Day. In her simplest form, Delphina is a place name. In Ancient Greece, Delphi was the spot to go if you were in need of a vision or two. The Greeks believed Delphi was the center of the Earth, and a place men could communicate directly with the gods. In fact, delphus means womb. 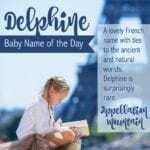 While many a baby name guide will tell you that Delphina means “from Delphi,” it’s not quite the same as being from, say, Jersey City. It’s easy to hear the link between Delphina and that ever popular creature of the seas, the friendly dolphin. It’s no coincidence. The Latin delphinus meant dolphin; some have theorized that the ancients named the creature after observing the way dolphins give birth to live offspring. They used the word womb to indicate that this curious fish didn’t lay eggs. If you’re not a fan of the high seas, you might want to skip this name. Much like bovine and feline relate to cows and cats, delphine is the adjectival form of dolphin, so the link is clear. Fast forward to the French, where delphinus became daulphin, daulfin or dalfin, depending on the dialect and the moment. 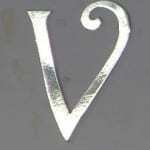 Once upon a time, the Count of Vienne, in Southwestern France, adopted the dolphin as his symbol on the family crest. Instead of Comte, the bearer of the title became known as the Dauphin de Viennois. Just like the heir to the English throne is the Prince of Wales, and the Spanish ruler-in-waiting is called Prince of Asturias, le Dauphin eventually became the title for the French prince next in line to be king. Apparently, the last of the Viennois nobles struck a deal to turn his holdings over to the crown in exchange for cash – and the continuation of his title. Dauphin – and the female equivalent for a consort, Dauphine – were used for centuries, with dolphins appearing on their royal crests. Delphina isn’t nearly as obvious as calling your daughter Princess, but there’s something quite regal about her nonetheless. Delphina’s not quite a saint – the fourteenth’s century Blessed Delphina has yet to be canonized. She’s remembered as chaste, humble and generous to the poor. If saintly status is important to you, never fear. In the early 400s, Saint Delphinus was Bishop of Bordeaux. There’s a Power Ranger called Delphine, and a controversial work by Madame de Staël shares the name. (Napoleon exiled her for her efforts – she wrote about the rights of women.) The name is reasonably popular in French-speaking Canada, but is seldom heard in France. You’ll also find Delfina in use, especially in Poland. In the US, Delphine last ranked in the Top 1000 in 1962; Delfina disappeared after 1934; and Delphina has never charted. Overall, Delphina is nicely uncommon. She has several appealing meanings. Best of all, she’s easy to spell and pronounce. And if Delphina is too much for you to consider for the first spot, Delphine might make a great middle name choice, too. I’m thinking of Delphina Grace nickname Della. A of my kids have biblical names, so trying to make a bible connection with may be a bit of a stretch?? My first born daughter is named Delphine and the most common response she gets from people, is “what a beautiful name” or “that’s the most beautiful name I’ve ever heard.” My daughter has striking looks, so perhaps that helps. Delphine loves her connection to the dolphin- smart, playful, brave, and helpful to humans (or so it is said). Another connection that we like is that to the delphinium flower, named for its brilliant blue buds that look like dolphins jumping off the stem. 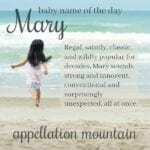 If you like nature names this is a good one to consider. I like both Delphina and Delphine. They occasionally make my lists of suggested middle names, when I remember to think of them. Delphina would also make a pretty alternative for parents who like Sophia but want something more original. Oooh, Viola Delphine is gorgeous! I hadn’t thought of using Delphine/Delphina myself, but maybe I should. i’m already up to my ears in Opera names, Delphine feels like she should be one! I hadn’t really considered this as a viable option before, but I’m really liking it! It’s got such a great history! I hadn’t even connected it with dolphins, somehow. Very interesting about how the term dauphin started. And the whole connection to Delphi is awesome. She’s definitely moving up on my list. What do you think of Viola Delphine or Delphina May? I had known about the dolphin connection, but not how it got to be the French next-in-line-to-be-king title. I LOVE the name Delphine, and I have a friend with this as a middle name. It has a clean, exotic, yet antiquated feel. […] Delphine – We love the sound of Juniper. Like June, it has that summery, syrupy feel. […] Last week was also Earth Day, and Elisabeth at You Can’t Call It “It” posted some intriguing options.